Here are some kind words that some of Wessex Weddings recent clients have written about our wedding photography. It’s amazing what a bit of bribery will do! Joking apart I’m happy to put you in touch with previous clients if you want to ask them about our service. 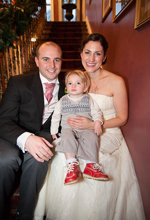 I think we have some of the best wedding photography testimonials going! 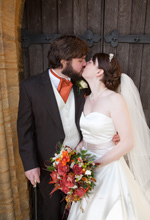 Just a quick e-mail (now that I’m finally back to work…) to say a huge thank you for our amazing wedding photographs. They were waiting for us when we got back from our honeymoon and are so lovely – well done to you and Andrew! 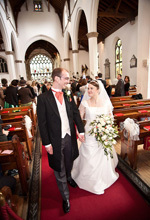 We had such a fantastic wedding day and it is wonderful to have these lovely pictures to look back on. I think our favourite shots are the beach pictures as they look so natural. Although I think the whole day felt very relaxed and both you and Andrew were so discreet – it was as though you weren’t there at times but you still managed to get some brilliant pictures! 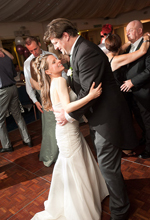 It goes without saying that we’d be happy to recommend you to anyone for their wedding and do feel free to use our pictures in any publicity materials for Wessex Weddings that you would like. photographs that you took on our wedding day. Thank you very much for your efforts, you have really captured the essence of the day for us and we’re in a real quandry when trying to narrow down which ones we’re going to put in frames!!! We have a real memento of the day, so real heartfelt thanks to you both. Thanks very much for all of your help, and for playing your part in our big day so well. We hope you’re well. The discs arrived safely last week. Thanks very much. The photographs look wonderful. You captured the day perfectly. It made a big difference having the photographs up on the website for our party; our family and friends loved looking through them, so thanks for working through the night! We enjoyed having you around for the day, your expertise as a witness was very much appreciated. Thank you again for all your hard work. We are delighted with the pictures and would happily recommend you to our friends! Thank you very much and really appreciate the gesture with regards to the weather and the extra photos you’ve given us. Thanks again Paul to yourself and Andrew. We enjoyed the day very much…except the weather. We just want to say a huge thank you for capturing our wedding day with such a beautiful set of pictures. We were so careful, in choosing a photographer, to find somebody who wouldn’t force us into formal lines but instead blend into the background while making sure that every moment could be remembered. We are so pleased with your set of pictures, helping us remember the bits that would otherwise be forgotten in time, but also opening our eyes to all the moments that we didn’t witness the first time. From start to finish it was such a pleasure working with you. We really valued your professionalism, guidance and most importantly, relaxed and down to earth manner. All the shots of family and friends-you really got everybody!! Hi Paul! Thank you so much for the email, the photos are AMAZING!! We love them and yes it was a truly fantastic day. We just wanted to say that we thought you and Sarah were terrific all day and didn’t make us feel uncomfortable at any point, and we think that the moments you both captured reflect the day so well. We have had many compliments about the day and about your professionalism and friendliness. Watching the photos again helped us re-live the day (with tears-again! and much laughter! )-Absolutely fabulous! Thank you as well for providing us with so many images, we’re glad you found so many wonderful pictures. 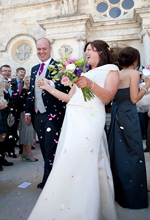 This entry was posted in Dorset weddings, Somerset weddings, Weddings and tagged / Dorset, / Wiltshire, anyone recommend, Bath, Bristol, Dorset weddings, dress, Gloucester, Highly, in Somerset, Love My Dress, photographer, Photographers, photography, Recommended, Salisbury, Somerset, Somerset wedding photographer, somerset wedding photography, South Wales, testimonials, value-for-money, Wedding, wedding blog, wedding photographer, Wedding photographer in Somerset, wedding photography. Bookmark the permalink.